The US economy hit a “soft patch” in the first quarter. The initial estimate of GDP growth for the first quarter of the year was 0.2%. This compares to growth of 2.4% for all of last year and hopes that growth might accelerate to 3% this year. As was the case last year, the weaker-than-expected economic showing can be blamed, at least in part, on severe winter weather. On the other hand, factors other than weather—such as the increased value of the US dollar and the dramatic slowdown in the oil patch—may have longer-lasting impact. Some indicators of economic activity, namely the ISM Purchasing Managers’ Index, auto sales, unemployment claims and retail sales, began to turn downward about the time the Federal Reserve ended its QE bond purchases last October. Shown in the graph below is the sum of bank credit and bank reserves, one measure of money supply. As a result of the curtailed purchases, the growth in the money supply slowed at year-end and again in February. By one measure, the money supply actually contracted in November and December before rebounding in the following months. THE US ECONOMY HIT A “SOFT PATCH” IN THE FIRST QUARTER. THE INITIAL ESTIMATE OF GDP GROWTH FOR THE FIRST QUARTER OF THE YEAR WAS 0.2%. Of course, part of the worry all along was that Fed policymakers would ease up on the monetary stimulus too soon and subvert the recovery before it had reached “escape velocity.” Now, with sluggish performance from the US economy in the first quarter, the Fed is unlikely to hike interest rates until at least September. Though there has been much public focus on the timing of any Fed rate increase, as the graph shows, monetary conditions have already been tightened without one. Despite another disappointing speed bump in the economy’s progress, stock markets remain at or near record highs. This reflects optimism that progress, however uneven, is likely to continue. In particular, it reflects confidence that the Federal Reserve can exit its extraordinary monetary accommodation without causing untoward consequences. And that Japan and Europe, now heavily engaged in their own versions of easing, can do the same. DESPITE ANOTHER DISAPPOINTING SPEED BUMP IN THE ECONOMY’S PROGRESS, STOCK MARKETS REMAIN AT OR NEAR RECORD HIGHS. Economists have different explanations for the persistently disappointing rate of global growth since the financial crisis and recession in 2009, despite high levels of support from central banks. The main hypothesis is that high levels of debt, both public and private, have inhibited demand growth, preventing the usual snap-back that often follows recessions. If this hypothesis is correct, and we think it is, then growth should accelerate after debt has been reduced to a manageable level, whatever that might be. While the debt burden has declined significantly from its peak in 2007, it remains high relative to post-war levels. 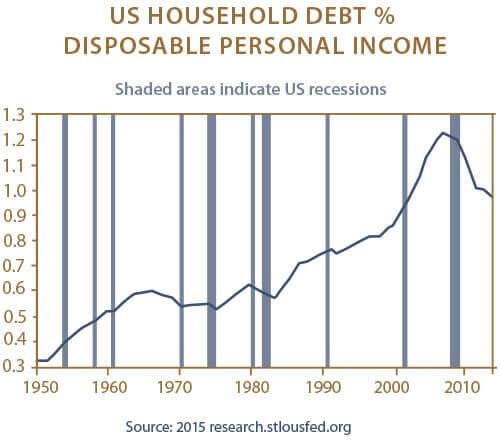 The chart below shows the ratio of household debt to personal disposable income. There is no way of knowing where this ratio may settle, but it may have further to go before debt becomes more manageable for the economy than it now is. Another hypothesis, though, is that there is something more pernicious at play. Larry Summers, the former Treasury secretary, revived the idea of “secular stagnation” in a speech to the International Monetary Fund in 2013. Essentially, Summers argues that the combination of slower population growth, lower productivity growth and rising income inequality have reduced the growth potential of the major developed economies. Further, these factors are largely outside the reach of current monetary policy, which may therefore only be able to boost growth by creating an unacceptably high risk of financial instability. Until debt declines further, it may be impossible to sort out why global growth remains sluggish. In the meantime, the Fed has expressed confidence that growth will rebound this year from the subdued level of the first quarter. The risks to this forecast are that the strength in the US dollar and weakness in the oil patch will depress exports and suppress investments. By the time you read this, we will have learned whether employment growth resumed its healthy trend in April, following March’s disappointing result. So far, stock markets in the US have digested the change in the dollar’s value and the dramatic decline in oil prices. In Europe, stock markets have performed well in anticipation of the efficacy of the central bank’s new monetary policy. It remains to be seen whether such confidence will be borne out by events. If you would like to receive The HeadInvest Quarterly by email, please e-mail: [email protected].